Making Instant Pot Cheesesteak Sloppy Joes is fast and delicious. This recipe seasons up ground beef and loads it with cheese, bell pepper, and onions for a tasty family entree that everyone will like. Do you love a cheesesteaks? 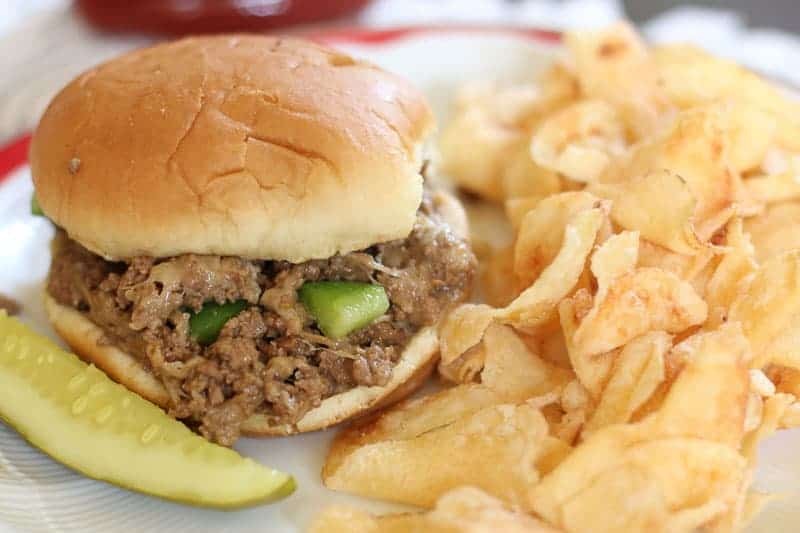 Do you love sloppy joes? Cheesesteak + Sloppy Joes= Brilliant!!! 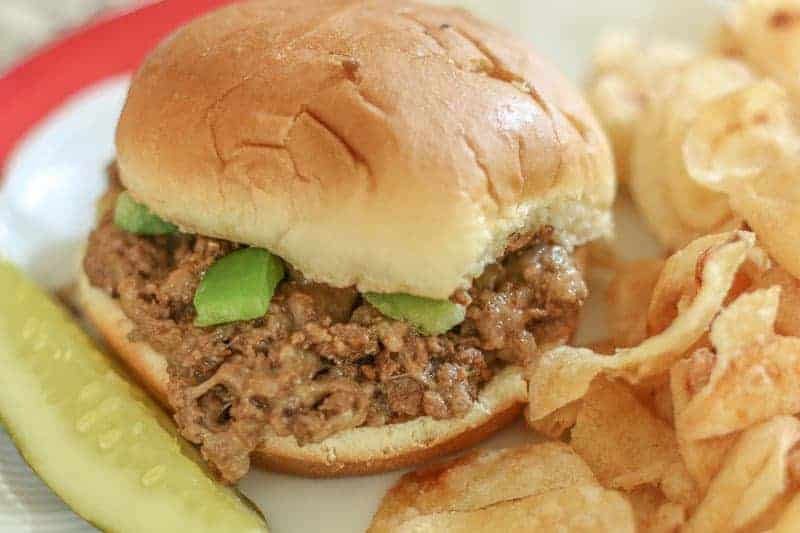 This Instant Pot cheesesteak sloppy joes recipe makes the perfect meal for the busy weeknights that your whole family will enjoy. My blog is famous for my 15 Minute Instant Pot Orange Chicken Recipe . My readers also love my Instant Pot Country Style Steak, and Instant Pot Shredded Buffalo Chicken. The Instant Pot has made cooking in my home so easy. I use mine weekly. It has become my favorite gadget in the kitchen besides my Vitamix. You cook everything in one pot and out comes a perfectly cooked meal. Where has this thing been all my life? I really wish I had it when my kids were little. It would have taken a lot of pressure off me at meal time…..
Meanwhile……. These cheesesteak sloppy joes are FANTASTIC if I do say so myself…. They have all the delicious flavors of an authentic cheesesteak created easily in the form of a sloppy Joe. You know; cheese, beef, onions, bell pepper, more cheese. If you eat these Pressure Cooker Cheesesteak Sloppy Joes in a lettuce wrap or by itself, it will be low carb! Just throw some veggie sides and you can eat this recipe without the guilt! When you realize what an easy recipe this is, you are going to love this sandwich. Turn Saute Setting on in Instant Pot. Add butter and bell pepper. Add ground beef. Cook until there is no pink in the ground beef. Add ketchup, Worcestershire sauce, water, and Lipton Onion Soup Mix. Mix well. Cook on Manual High Setting for 6 minutes. Fast release. Add in cheese. Mix until melted. Serve on a hamburger or sub roll. Or if you are eating low carb, serve it on lettuce! What are some good toppings to put on a Philly Cheesesteak Sloppy Joe? Looking for side dishes for Philly Cheesesteak Sloppy Joes? 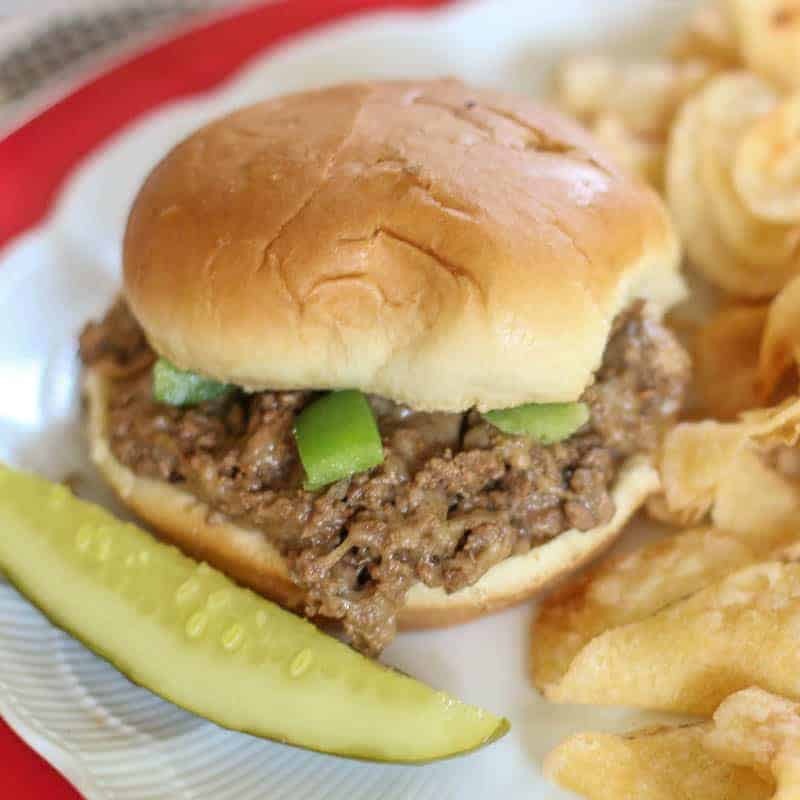 If the Philly Cheesesteak Sloppy Joes are super easy to make, you will also want easy side dishes to go with it, right? Here are some side dishes for sloppy joes that are fast and simple to throw together. 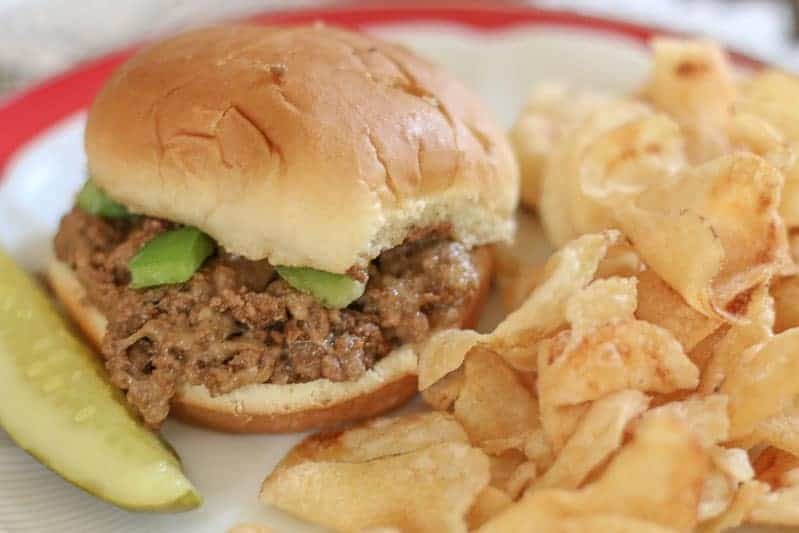 This Instant Pot Cheesesteak Sloppy Joes Recipe is fast and delicious. This Instant Pot Recipe makes the perfect meal for the busy weeknights that your whole family will enjoy. Hamburger Buns or sub rolls. Add ketchup, Worcestershire sauce, water, and Lipton Onion Soup Mix. Serve with your favorite cheesesteak toppings on a hamburger or sub roll. No, the cooking time will remain the same. If I were to double the recipe should I double the cooking time? My sister-in-law cooked it on the stove and had no problem. I would cook the meat with the ketchup, Worcestershire sauce, water, and Lipton Onion Soup Mix for about 30 minutes at a medium to low heat, stirring occasionally, in place of the manual high setting. That should allow the meat to absorb the flavors. Can this be made on stove top in a pan instead of instant pot? Sounds like great suggestions. Thank you Rebecca. I loved it!! I substituted beef broth for the water, added 1/2 a diced onion, and used 3 tablespoons of tomato paste instead of ketchup. I also used sharp provolone, and it really complimented the flavors!! I will be making this again. It was a big hit!! Great tip Carol… I usually use really lean meat, so I didn’t think about that for my readers. I am glad you enjoyed the recipe! The only edit i would recommend is draining the fat off the beef. The recipe didn’t call for this and I didn’t do it. The flavor was awesome but too much grease that i ended up wicking off with paper towels. Great recipe though! It will be fine without peppers. How do you think this would taste without the peppers? I feel lkke my kids will throw them at me! Yes. If I were cooking it for me, I would….. Some people don’t like the added onions with the soup mix. I say more the merrier. Would adding diced onions to the mix be ok? My family really loves onions! Yes. Try it. It will come out like promised. You would need more water if you were making a pot roast or something bigger, but I cooked the meat in the Saute setting, so this isn’t the case. I thought that the Instant Pot needs a minimum of 1 cup of water in order to come to pressure. You only used 1/4 cup of water? Thanks for the great recipes.